Decades after internet access became widely available, Pew Research Center surveys show that about a tenth of American adults (12%) remain offline. But what happens when some of them take the plunge and connect? A new analysis provides a glimpse of the online behaviors of those who are new to the internet. The Center provided internet-connected tablet computers to 112 people who are members of our American Trends Panel. These panelists, who previously received our surveys through the mail, had never used the internet under any circumstances. 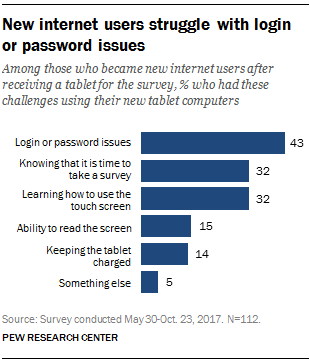 This change allowed these respondents to become internet users if they wished by using the tablets for online activities other than taking surveys. For starters, having access to the internet did not lead to more online exploration for some of the people we studied. About four-in-ten (39%) reported they had used the new tablet they were given only for taking surveys and did not attempt any other online activity we queried. This is consistent with past Center findings that many non-users of the internet say they are not interested in going online because they do not want or need the technology. Some had difficulties with their tablets. Pew Research Center surveys have shown over time that later adopters of the internet often say they need help with their new devices. Not surprisingly, a share of these new users struggled with the device. Seven-in-ten called tech support to get help with the tablet, and 43% experienced login or password issues. Nearly a third (32%) reported that it was a challenge learning how to use the touch screen. And 14% said it was a challenge to keep the tablet charged. Some ventured out into online activities. In addition to using the tablet to take the American Trends Panel surveys, 61% of these panel members performed at least one other online activity. 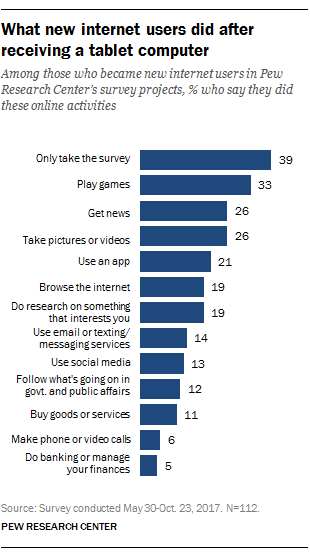 Some tried relatively simple activities: 26% got news and 21% used an app. A share also used the tablet for things that are not necessarily online tasks: 33% played games and 26% took pictures or videos. Smaller shares reported performing social activities like using email or texting and social media. These new users had a particular demographic profile. As a group, compared with more-veteran internet users, the first-time users in the sample skewed older, more female and had lower household incomes and educational attainment. In this sample, females outnumbered males by about two-to-one, in contrast with the overall internet population, which is half female. In addition, very few of the newcomers were younger than 50. Pew Research Center’s telephone surveys of American adults have shown over the years that internet users are more likely to be younger and better educated and to have higher household incomes, and there has been general parity between men and women adopters since 2000. For example, the most recent Center survey shows that 99% of adults ages 18 to 29, 98% of adults who make $75,000 or more a year and 98% of college graduates are internet users. New users liked going online to learn new things and access entertainment. The first-time internet users in this study were also asked some questions about the impact of their tablets on several internet activities. The Center did not get enough responses to do a statistical analysis of the findings. 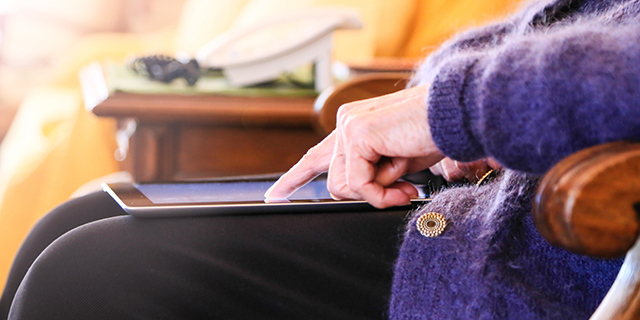 But some of these adults found the tablet most helpful for learning new things, accessing entertainment like videos, movies and online music, and staying in touch with family, friends and neighbors.